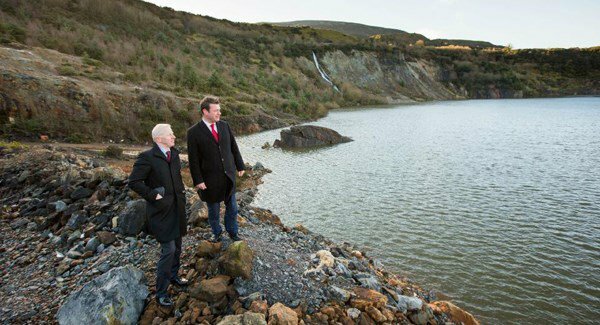 Minister for the Environment Alan Kelly has just announced a proposed €650 million hydro-electric plant which will seek to create 400 construction jobs and 50 permanent jobs on a disused mining site in Silvermines North Tipperary. The hydro electric power station project will be the second of its kind in the Republic, along with the ESB’sTurlough Hill (292MW) facility, and Ireland’s most efficient electricity generation plant with its 360 megawatts. It is also one of the largest ever private infrastructure spends in the county. “The overall value of benefits flowing into the national economy will exceed €2.5 Billion,” said Kelly at the launch event in Nenagh, before adding the project would “transform the mining legacy here from an environmentally hazardous to a positive one”. The Silvermines Hydro Electric Power Station will generate electricity during high demand periods as water from a higher elevation reservoir is released to a lower reservoir, flowing through giant turbines in the process. It is then pumped back up to the higher reservoir during low electricity demand periods. The project begins with a detailed feasibility assessment and consultation programme with the local community, before moving to an 18 month to two year planning process later this year.